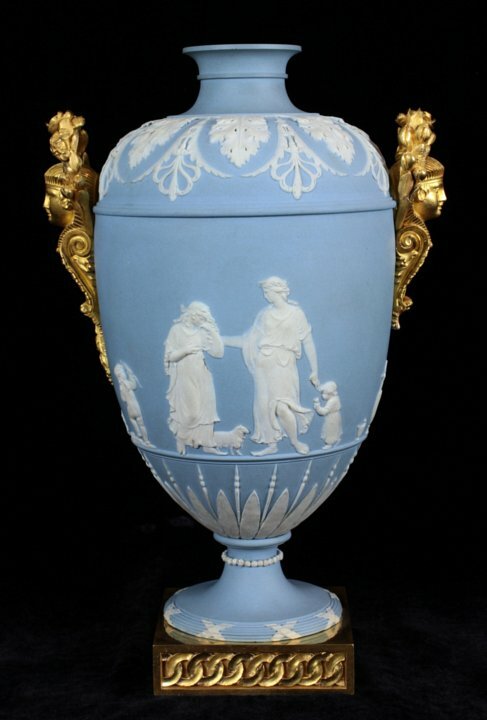 Wedgwood vase with Louis XVI ormoulu mounts with original gilding, probably by François Rémond and furnished by Dominique Daguerre. The shoulder is decorated with a band of molded acanthus alternating with pendant anthemia. The frieze depicts An Offering of Peace by Lady Templetown. (A plaque of the same subject is in The Metropolitan Museum of Art.) The personification of Peace consoles a grieving widow and her child as Cupid brandishes his bow while standing on his quiver of arrows, implying a future love for the young woman. Dominique Daguerre acquired the monopoly for importing Wedgwood to Paris in 1786.